We are programmed to get old and look old, but it doesn't have to be that way. Age and longevity are relative. Some people at age sixty-five look forty-five; others at sixty-five look eighty-five. We can do a great deal to improve our looks and our quality of life by simply changing our diet. Aging is a disease of diet, and more specifically aging is a disease of progressive acid saturation. Alkalized water can help stop the body's deterioration! Hexagonal water is created through a process that not only alkalizes the water but changes its structure to increase bicarbonates in the blood that neutralize the acids. This water contains an abundance of hydroxyl ions that effectively neutralize free radicals in the body, reducing the potential for disease. This book revolutionizes how we think about aging, disease, and death. Howard Peiper, ND, is a doctor of naturopathic medicine. While beginning his career in optometry, he was immediately drawn to the field of alternative health. In 1972, he received his degree in Naturopathy. After a decade in private practice, Dr. Peiper moved on to become a successful consultant, speaker, and writer. Over the years, his cutting-edge articles have appeared in numerous medical journals and magazines. He also serves on the medical advisory board for several nutritional companies. 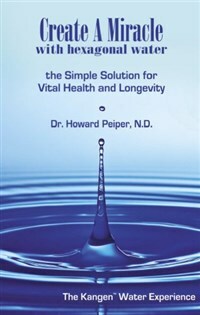 Dr. Peiper has written several bestselling titles including The ADD & ADHD Diet! and New Hope for Serious Diseases. He is a frequent guest speaker on radio and television and has hosted his own shows including the award-winning TV show, Partners in Healing. Currently, Dr. Peiper lives in Southern California and continues to travel and lecture throughout the world.